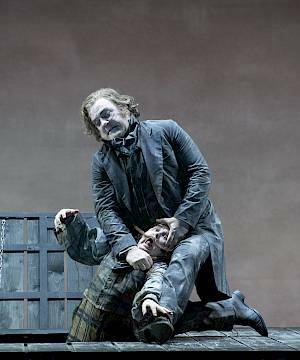 Welsh baritone Bryn Terfel plays Sweeney Todd - an ideal Todd if there ever was one. The role is murderously difficult and demands an outstanding performer with the darkest of vocal timbres. 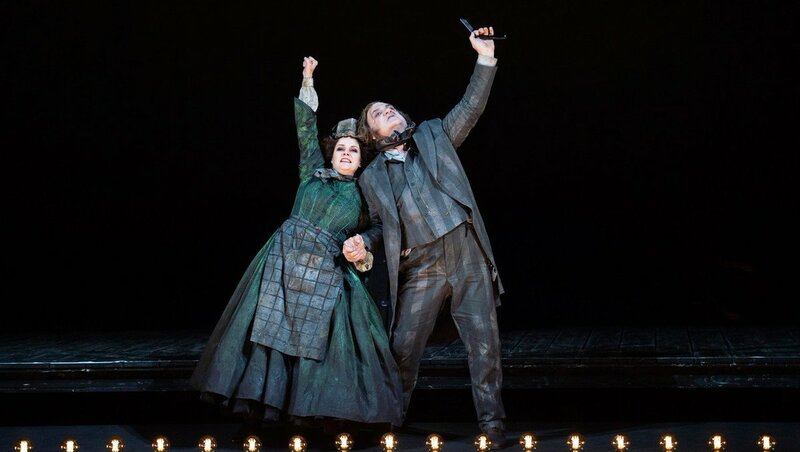 Terfel has already thrilled audiences as Todd at the English National Opera and at the Lyric Opera Chicago. His partner in crime is Austrian mezzosoprano Angelika Kirchschlager, making her debut as the dutiful purveyor of meat pies. At the podium of the Philharmonia Zürich is David Charles Abbell, a veteran musical theater conductor. We offer introductory matinees on every new production: in discussion with our dramatic advisers, conductors, directors, set and costume designers explain their view of the works to be performed. One or two weeks bef.ore the première, you will thus gain a direct insight into the special characteristics of the production. We are delighted that this introductory matinee will present not only the director Andreas Homoki and the conductor David Charles Abell but also the singers Bryn Terfel (Sweeney Todd), Angelika Kirchschlager (Mrs. Lovett) and Spencer Lang (Tobias Ragg). The matinee will partly be held in English. CHF 1O incl. coffee and croissant. 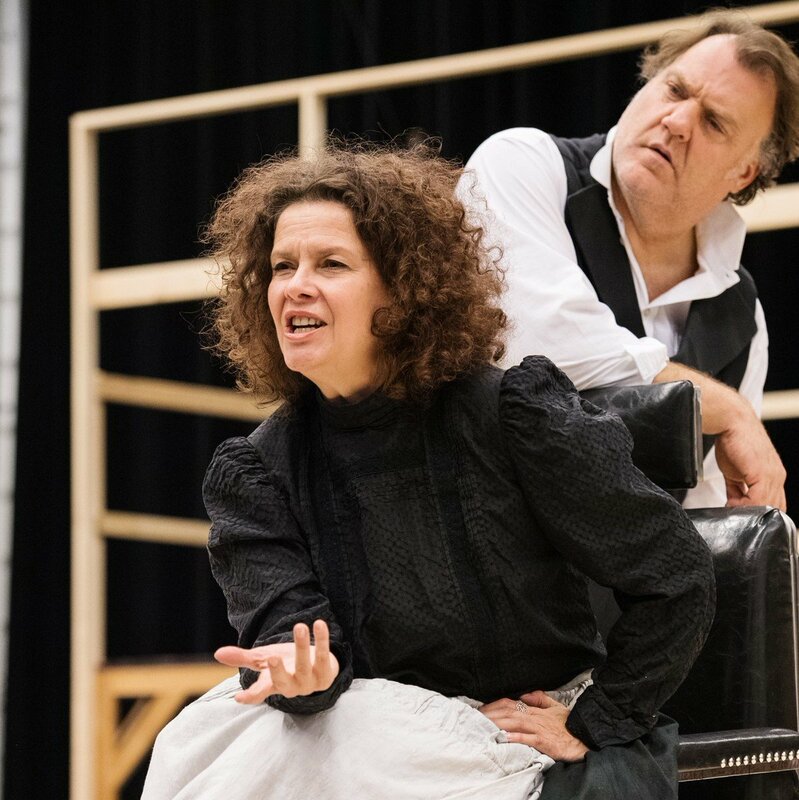 Sweeney Todd and Mrs Lovett. Sweeney Todd in traditional Victorian costumes. Bryn Terfel is the most sought-after bass baritone - and the quickest. He is currently rehearsing "Sweeney Todd" in Zurich. Bryn Terfel, what is it like to play in a role against Johnny Depp? Ha! He's in Hollywood, not in Zurich. I can not imagine that he would sacrifice two and a half months for a performance at an opera house. That would be difficult with his fee. But many who will see "Sweeney Todd" at the opera house know Tim Burton's film with him. You still do not know the musical, it was pretty much shortened for the movie. We now have the whole wonderful score in which everything really fits in: family, love, revenge, death. Comedy, tragedy. It's not a Christmas holiday, it's not. But great theater. They once sang it together with Oscar winner Emma Thompson to stay in Hollywood for a while. How did that happen? Well, Emma Thompson is a very good friend of the actress Imelda Staunton, and she had sung Mrs. Lovett with great success. That Emma then wanted that, could probably be described as a kind of friendly rivalry. Anyway, she asked Imelda if she should dare, and she said: Absolutely, but you have to study the score one year before the performance. And, did she do that? Yes. She came to the test perfectly prepared. A real role model in terms of quality, integrity, hard work. Even for you, the piece is an unusual challenge. For example, you have to sing with reinforcement. The orchestration is very heavy. Massive percussion, fat strings. But we learn a lot in our music room. And it's important to remember what you've worked out on stage. If you give that up, it's the downfall. One should not neglect the voice, the pronunciation. The microphone gives you no freedom. And how about the dialogues? Many singers hate spoken passages. But we know that from the "Magic Flute"! But it's handy that English is your native language, is not it? I still have to think about how to make the text so that it comes alive. Where I can speak quickly, how incidentally - and where I have to transport specific information. How is singing? What role does language play for you? We singers are multi-lingualists, we sing in all possible languages. But English is, so to speak, the most international language - I would find it terrible if people went out of the theater and said they did not understand a word. Do you still remember the three tenors? (sings) "I justa metta a girla named Maria" - that's horrible, that does not do justice to Bernstein's piece. English is difficult to sing, you have to articulate very clearly. Diaphragm support, breath control, not too fast. They also sing other languages ​​amazingly accent-free. I sing Wagner, that's a distant, unfriendly language for me - but I have to learn it so that I can present it in every country in the world. And when I sing bad Italian in Italy, I can never go back there. Does it need a special talent? Or are good language coaches enough? For some languages ​​you have a feeling that you can correct yourself to a certain degree. "Boris Godunov" was interesting for me: I do not have that feeling for Russian, so I was really at the mercy of the coaches. Now it is like that, that you learn an opera over a longer period of time, not just in one place. When I prepared "Boris Godunov", I was in Monte Carlo, Paris, Colorado and New York. So I needed a voice coach and a pianist in all these places. These are challenges! And we have not spoken of the voice yet. Yours is pretty black; has she always been that? No, the voice changes with age, depending on what you sing. I started with Mozart, it's about lightness, in the voice and in general. When you sing "Le nozze di Figaro", you have fun on and off the stage. Since everything is very collegial among the singers, you go eat together and go to the movies. As soon as you start with Wagner, you get bored, even though Wagner singers are really funny people. One is aware that one can only survive these long pieces when the voice is sound. But bass-baritone parts often age well? We're sitting here in the Opera House dressing room under a tray with tenor's trial shoes. Exactly, that's nice. Lawrence Brownlee can sing enormously high and endless coloratura. Roberto Alagna - that's where the Tosca comes to my mind. Then Piotr Beczala, Pavol Breslik - especially, who gathered there so all. You yourself would not be imaginable as a tenor. I would be a great tenor! The best! Or at least the best Otello. I could sing Peter Grimes, Andrea Chénier. Every baritone would like to be a tenor. Matti Salminen once said that he wants to be the tenor for a single day and then sing Tristan. Good choice. He would be a very good Tristan. But for me that would be nothing, I do not want to learn such a long opera again. Although I learn easily, it's interesting what the mind can do when it's under pressure. In a few days you can put a whole opera in your head. Can you forget them quickly? What you learn quickly, you forget quickly. But if something lingers in the back of your mind for a long time, it stays that way. At the moment I'm constantly whistling "Sweeney Todd" in the tram. People think then, I'm crazy. But that's the way it is when you're in the right place. 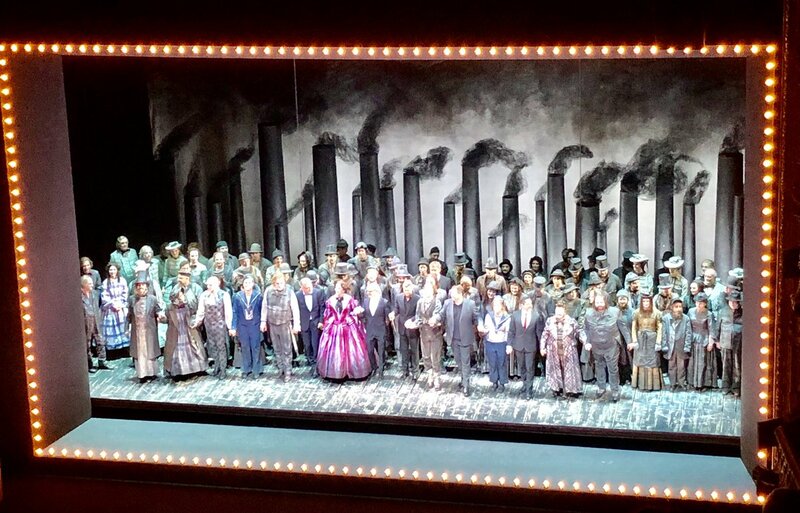 Big jubilation for a gripping premiere of the musical Sweeney Todd at the Zurich Opera House with a towering Bryn Terfel and a gorgeous Angelika Kirchschlager! Absolutely buy a ticket. The Welsh bass baritone and world star Bryn Terfel sings and plays this Sweeney. And he makes it so intimate, so poignant, that you forgive him all murders and feel deep compassion. Trailer - Sweeney Todd - Opernhaus Zürich. Is Sweeney Todd a musical? An operetta? Or an opera? In our new episode of "What you've always wanted to know about the opera house, but never dared to ask" clarify bass baritone Bryn Terfel, mezzo soprano Angelika Kirchschlager and conductor David Charles Abell.